In a little village somewhere in West Africa, a boy named Kirikou is born in a spectacular way. But he's not a normal boy, because he can speak and walk immediately after being born. He is also very determined. His mother tells him that an evil sorceress has dried up their spring and devoured all the males of the village except for one. Hence the tiny Kirikou decides to accompany the last warrior, his uncle, to visit the sorceress. 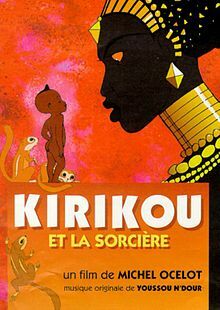 Kirikou tricks the sorceress and saves his uncle. He saves the children from being kidnapped by the sorceress's boat and saves them later again from the sorceress's tree. Next, he bursts the monster who was drinking all the village's water. He then travels to ask his wise old grandfather about the sorceress, and faces many obstacles in the process. The grandfather finds that Kirikou is always asking questions, which is a good thing. The grandfather tells him that she is evil because she suffers: bad men put a poisoned thorn in her back. Kirikou manages to trick the sorceress and removes the thorn. The sorceress is cured. She kisses Kirikou and he becomes an adult. Love reigns.